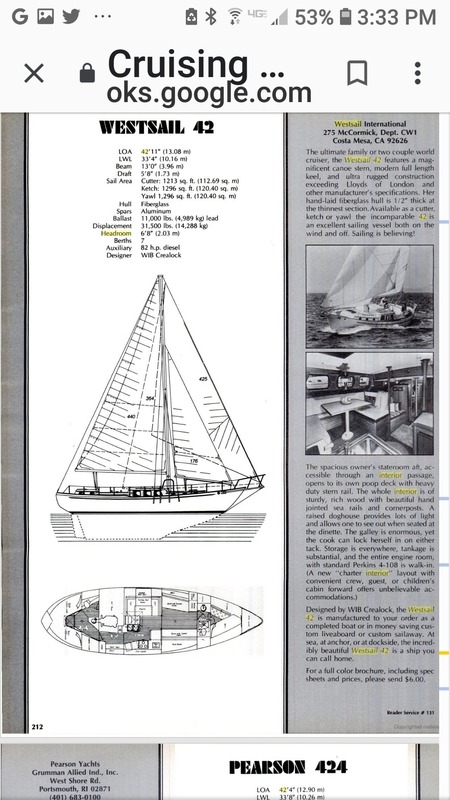 Can anyone help me with the interior headroom of a westsail 42 and 43. I would love to look into purchasing a westsail 42 very soon but I'm concerned about my 6'3" height. It will be a cruising live aboad for me. I'm in a leg cast and will not be able to look for myself for about 6 weeks. I do not want to set my Hope's on a westsail only to be disappointed by say a 6' salon height. As others have mentioned across the web, boats need to have accurate headroom displayed on listings. It would just make thing so much easier for us tall guys. I may of found an answer, help in knowing the accuracy would be great. Outside of that this newbie says: nice platform for asking and sharing information. Height at companionway - 6' 3 1/2 "
Height at step-down leading to main salon / small area before cabin top steps down- 6' 9". Height in salon area after cabin steps down - 6'. Height in passageway leading to aft cabin - 5'. Height in aft cabin / stateroom - 5' 11"
Height in engine room - 4' 10". Oh, whatever vessel you look at, take a very close look at fuel and water tanks. If they have not been replaced, they will probably will have to be replaces in the near future. This is a huge project. On our W42, the main tanks were sitting on the bottom of the upper bilge which is NOT a good way to go !! There were 1 1/2 " hole in them when removed and inspected. Hope this helps. Of course heights may / will differ with each individual vessel's layout. I can't thank you enough for taking the time to help me with some great information. I truly had my heart set on a Westsail and I must admit I'm a little disappointed with most sailboats when it comes to headroom. It seems like when I can find the needed headroom I'm no longer looking at a quality blue water boat. A Morgan 41or 43 classic is well within my budget with my needed head room but appears to the draft or bulkheads needed for major blue water sailing. George I'm grateful for people like yourself who take the time to help guys like myself needing some first hand experience with a particular boat. I have not yet counted out a westsail 42 and hear you very clear on the tanks. All though I work as an industrial electrical contractor all my life I would hesitate before taking on such a large refit as you have. Sounds like you have a total labor of love going on with your boat, I have total respect and admiration for that. My self on the other hand I'm looking for a boat pretty well ready to go blue water, with a recent refit. I know I will have to pay for that, nothing is free. I have not sailed much in years and recently divorced I thought it was time for me to sail before sunset. So I will spend one or two years here on the west coast before expanding my travels with my growing experience. Yes, the best is to find a boat with a recent refit and one will have to pay for it as we talked about. I thought that I could have done a project each year as time went on while sailing the boat. But, as I worked on the boat, one issue lead into another and so on. And with other obligations, here I am. Luckily I am capable of doing most of the work on the boat and am still in good health. And of course, always learning. As we talked about on any boat, take a good look at the fuel and water tanks, and preferably make sure that they have inspection ports for each baffled section for inspection and cleaning. And that they have adequate ventilation around them to help prevent corrosion, etc. On a prospective boat see if the owner / seller would be open to having the tanks pressure tested. Also, I recommend looking at the prospective boat several times, seeing something new each time. On the first visit, one can get excited and miss certain details good or bad. Westsail sailboats are stout seaworthy boats as are many others. Good luck in your search and endeavors .